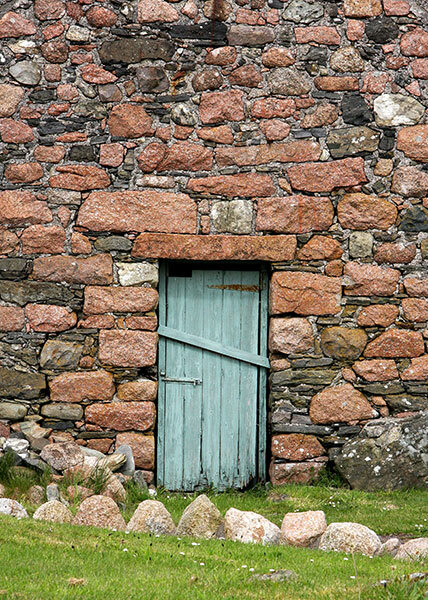 A day devoted to a journey to Iona by ferry and coach from mainland Oban is richly rewarding. The magnificent open water views across the Firth of Lorn on the ferry to Craignure are followed by those across the wild landscapes on the southern Mull road to Ffionphort pier and its ferry. At the northern point of Iona a crescent of white sand shares the shoreline with outcrops of stone. Traigh an t-Suidhe (Beach of the Seat) is backed by grassland growing on accumulations of wind-blown sand. Walking is leisurely in this and the central area of the island. There, and to the west of the Abbey the monks worked fertile fields on this machair. To the south, the rugged rock terrain requires more energy and care. 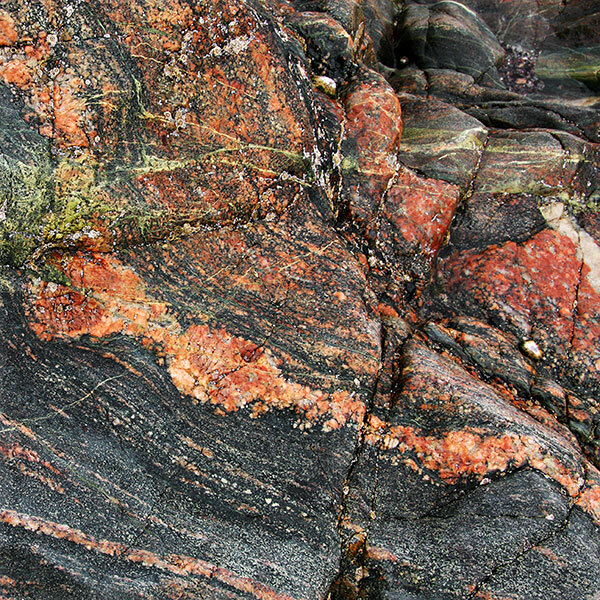 For such a small island the geology of Iona is varied and has unique formations such as this Lewisian gneiss fringing Scotland's north-west coast. 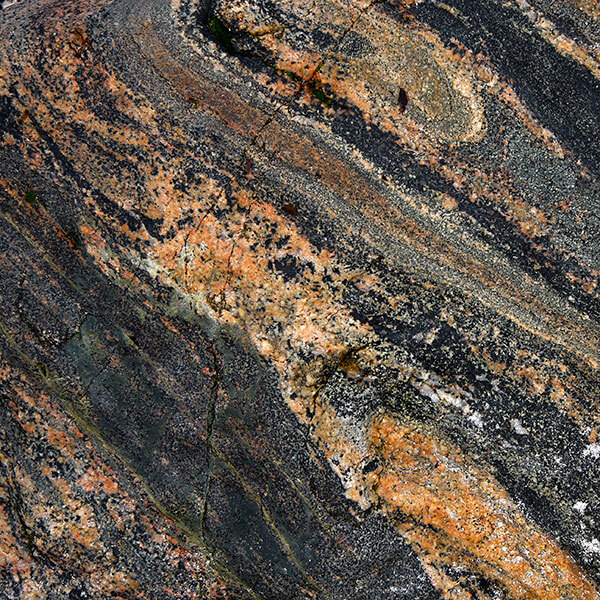 The red and blue banding is apparently typical of both its structure and colour. 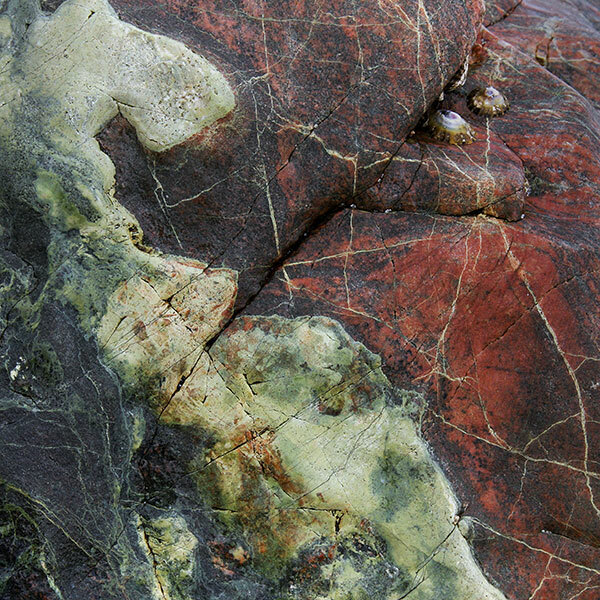 The beautifully saturated colours soon faded as the tide ebbed and surfaces dried. 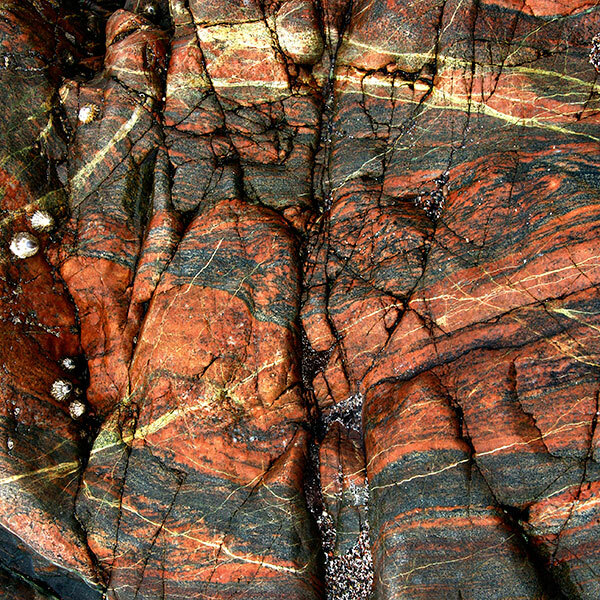 In south Iona and for over a century a veined white marble was extracted until the quarry closed c1920. Sandstone beds contrast with the more predominant volcanic rock. On this brief visit I'd planned to use 'stone' as a short image-making theme whilst concentrating much of my time on exploring the Abbey and walking the easier northern landscape. Many more abstract colour compositions presented themselves but they and wider camera work will have to await a future visit. 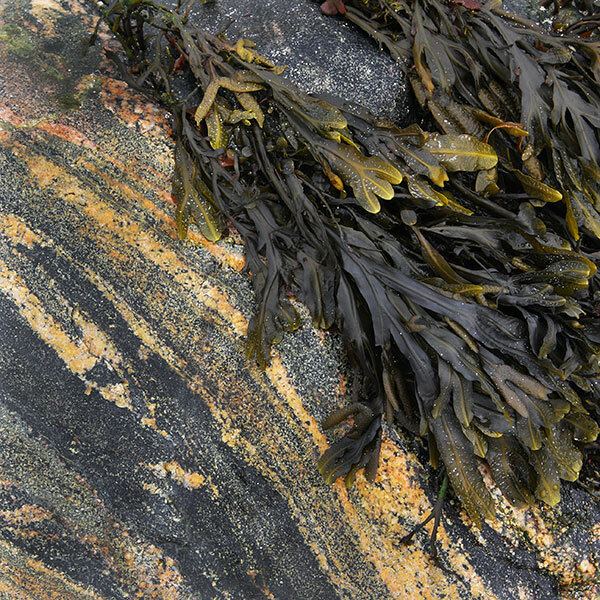 Following a receding tide, the colourful geology of the upper shore soon disappeared under the seaweed growth. Increasingly overcast skies muted the landscape colour. Rain showers were not welcome walking companions but they did enhance the colours of the stone in field walls and buildings. 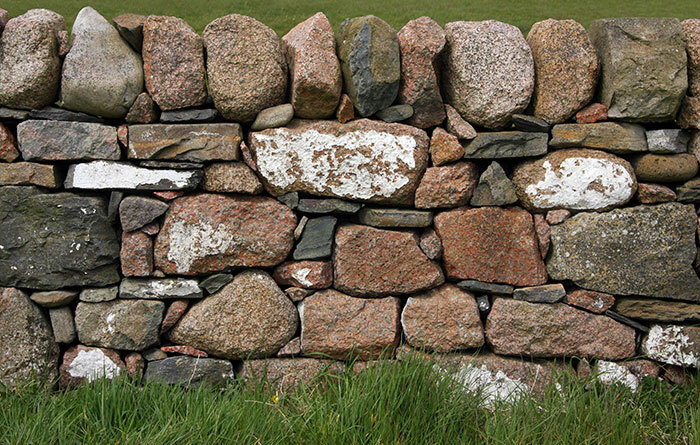 Inevitably, fields and gardens were bounded by dry stone walls. 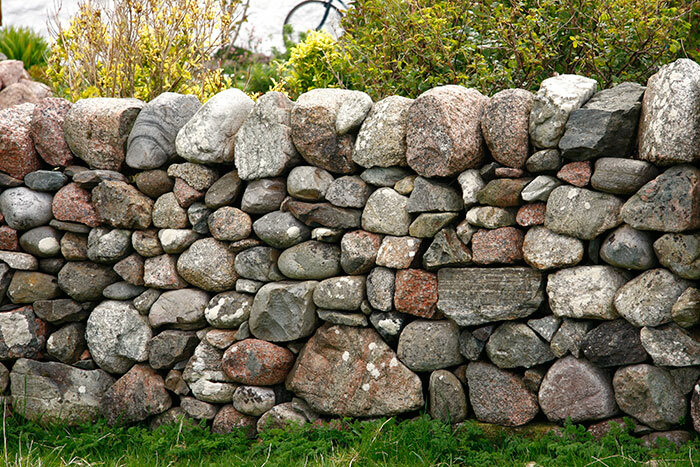 Some were formed entirely from rounded beach stones whilst others incorporated random slab and quarried stone. 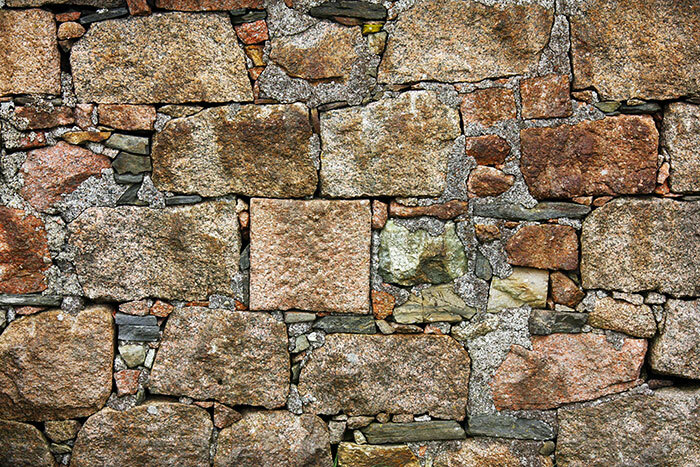 In this three-dimensional jigsaw these substantial stones were fixed into position by smaller and fragmented pieces but the usual coping stones were absent. The daisies in the grass give scale: there must have been more than one builder at work to lift such large pieces. Ingenuity and experience must have underpinned this construction. Rain showers brought out the colours in this more considered design. A bold assemblage of forms is topped by a substantial boulder coping. 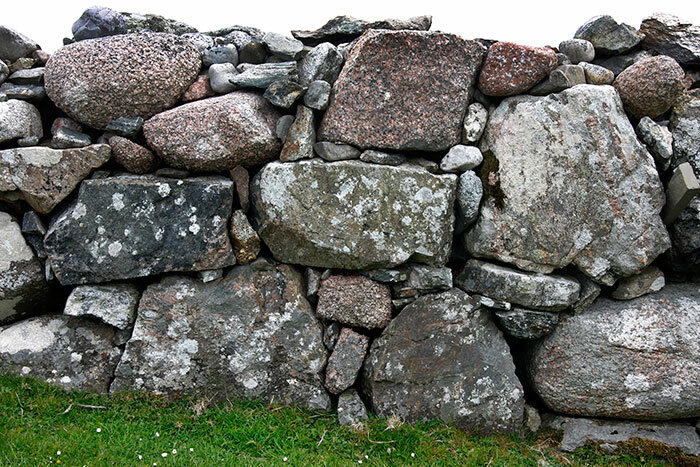 The weathered white paint suggests that some of the stones were once part of a building. 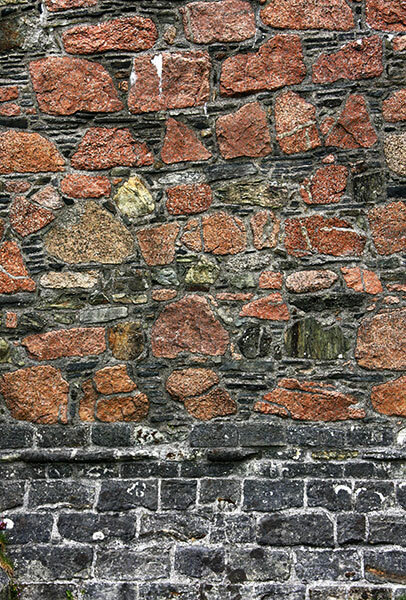 This is a fragment from a building that's much more conventional in surface appearance than those that follow. In all of the images I was attracted by abstracts of shape, pattern texture and colour as well as the skills and creativity of the builders. The gable of a simple outbuilding fronts the road to the northern beach. St Columba brought Christianity to Iona from Ireland in 563. A monastery was a centre of learning and a base from which missionaries travelled to convert the population at large to the Faith. 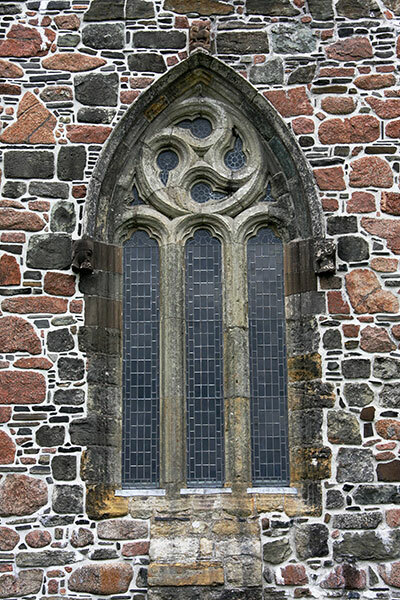 Scandinavian Vikings occupied Iona around the first millennium as they did other parts of both England and Scotland. In 1200, an Abbey was established by the Benedictine Order after which new construction continued the development of the buildings that had evolved over a long period of time. For some fifty years from 1450 this new work and the reconstruction of the old formed the basis of the present buildings. 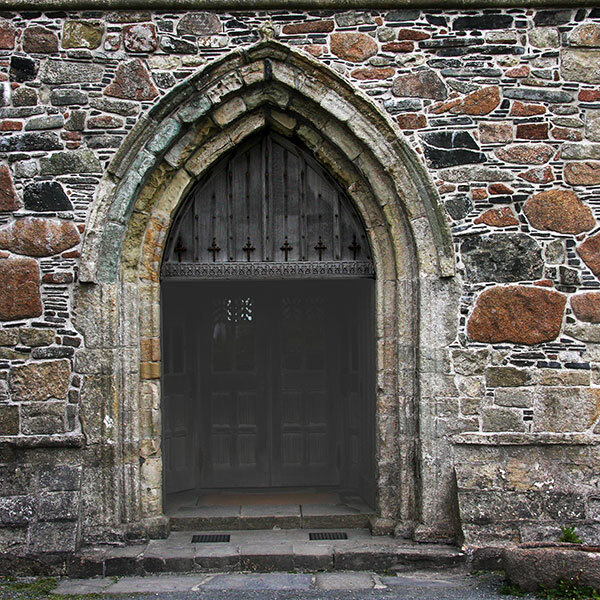 The Scottish Reformation and other changes both local and national caused the end of appointed Abbots and the abolition of the Iona Bishopric in 1638. Gradually the various buildings fell into disrepair and decay: nineteenth century photographs show how ruinous they had become. 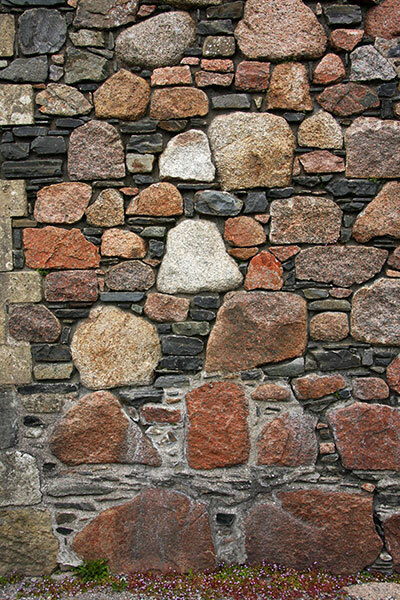 Stone had been removed for use elsewhere and other functions were found for what remained of the buildings. The eighth Duke of Argyll began a restoration of the Abbey Church before giving it and the Nunnery to the Church of Scotland in 1899. Their undertaking to complete his work on the Church was realised in 1910. The Nunnery remains a stabilised and beautiful ruin close to the village and harbour. 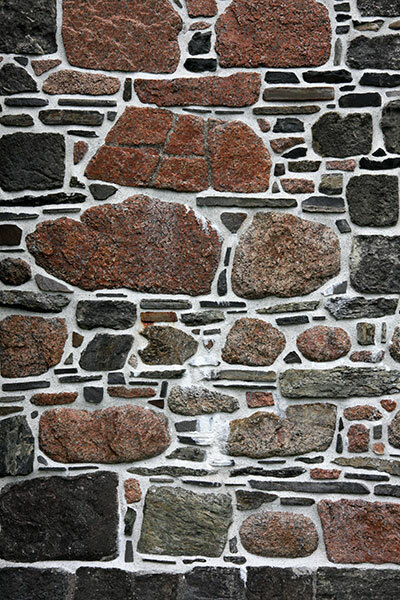 The restoration of other buildings by the Abbey Church is the work of The Iona Community. This group was established in 1938 by George McLeod specifically for that purpose and also to promote Christianity further afield, just as their seventh century forbears had done. The rich variety of stone used in the buildings includes sandstone carved for window and door details in addition to quoins and general masonry. Weathering has eroded the simple carving of the sandstone casing to the West Door. There are many architectural riches to be seen inside the building. 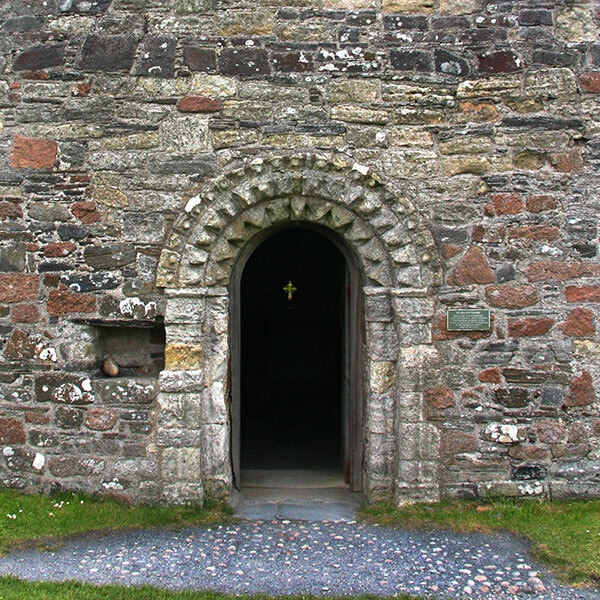 A succession of medieval Kings of Scotland is buried on Iona. Small carved heads add intriguing details to the simple Gothic styling of the South Transept window. 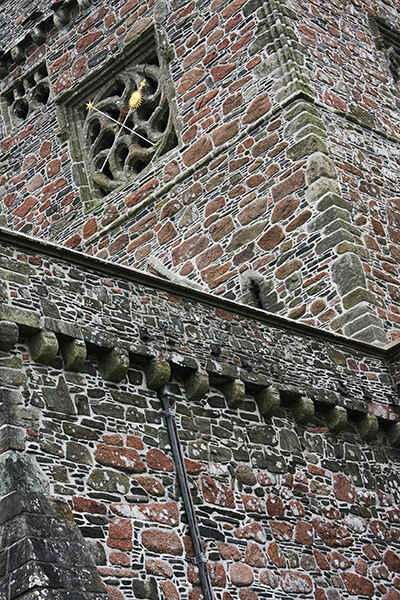 I was fascinated by the variety of the stone shapes and construction patterns across the Church. The bright and almost white pointing in Image 13 contrasted with the grey of Image15 and the shadow-casting recessed technique in Image 14. St Oran's Chapel stands within a small graveyard adjoining the Abbey. Its original and then ruinous12th Century walls survive intact and restored under a 1957 slated roof. Small windows and the open door give light to the sparsely furnished interior. Incised stone grave slabs are set into the floor and against the walls. Light reflects from the polished metal of the altar crucifix.